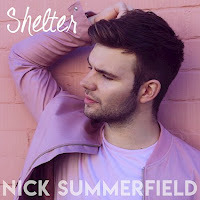 Nick Summerfield is an electro-pop musician from Sydney. Self-taught and born in Wollongong, Australia, he picked up music during his teenage years and at the age of twenty moved to Sydney to pursue his passion. Nick has had his works across Film, TV and performed in The 2018 Macy’s Thanksgiving Day Parade. 2018 marks the start of his career as an artist. Shelter started in a hotel room in Los Angeles in January 2016. It was produced by SZABO at Ringtail Studio and mastered by Andrew Edgson at Studios 301 in Sydney. It was released on Monday 15 January, 2018, which marked the two year anniversary since it was started. This track is a great first step for Nick in finding where he sits as an artist – blending pop with a sense of individuality. ‘Shelter’ is out now on all good digital stores.